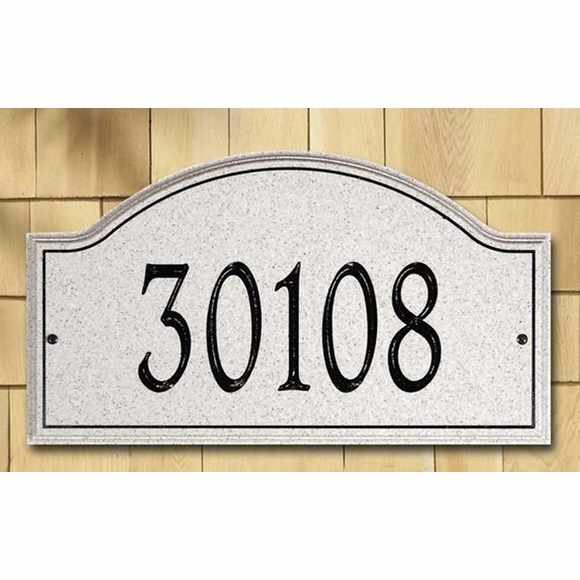 Personalized Estate Size Carved Acrylic Address Plaque - - 1 line faux stone address sign for wall mount holds five 5.5" numbers. Made in USA. Carved "stone" plaque is made from acrylic solid surface material. This contemporary plaque comes in three shapes: arch, modified rectangle, and oval. The arch and rectangle are sold with or without a subtle decorative emblem. Six neutral color options: 01GD (sandstone with gold numbers); 01BK (sandstone with black numbers); 02GD (limestone with gold numbers); 02BK (limestone with black numbers); 03GD (granite with gold numbers); 03BK (granite with black numbers). Arch dimensions: 22"W x 12.38"H.
Modified rectangle dimensions: 23"W x 12"H.
Oval dimensions: 22"W x 12.38"H.
An easy way to add curb appeal and dress up your front porch is with a personalized address plaque.